Ravi and Geeta Patel's MEET THE PATEL's has been kicking around Unseen for over a year now. The film was a big to do at DOC NYC in 2014 where several Unseen Films people saw the film, but no one wrote it up because everyone thought someone else was going to do it. I realized that there was no review at Unseen when I went to repost the review for the home video release. I could find the Q&A that Chocko shot but no actual review. No matter, I ended up with a copy of the DVD so I could watch the film and give a report. 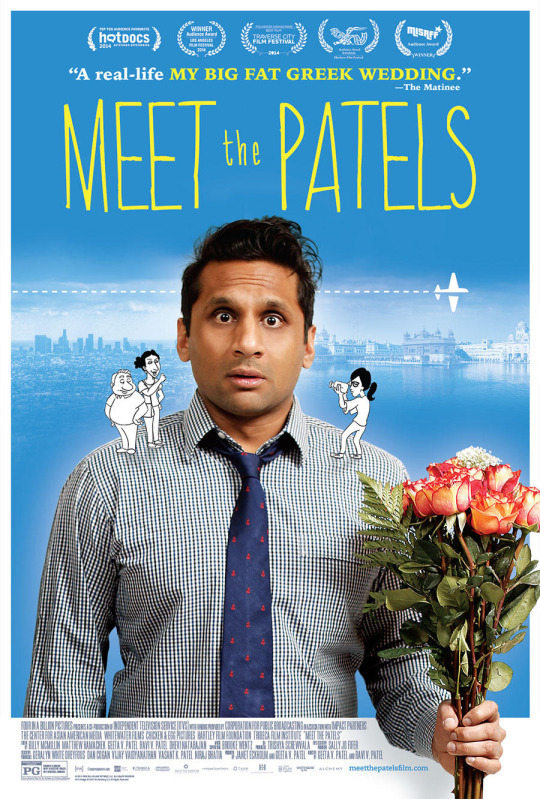 MEET THE PATELS is the story of Ravi and his quest for love. Actually Ravi had found love with a red head from Connecticut, but after two years of a secret relationship he wigged out at having to tell his parents about the relationship and broke it off. Ravi then found himself on a whirl wind trek to find a girl, also with the last name Patel, in order to please his parents who thought that the almost 30 ear old should finally have a girlfriend and get married. What follows is a very funny, extremely human film about searching for love, trying to please one's family and just trying to find one's self. There is a reason that this film has been kicking around for a year and that's quite simply that it a great film. Its an utterly charming film that is full of a whole bunch of people you would want to hang out with. Yea Ravi's family and their ideas sometimes make him crazy, but at the same time his family is very much like families everywhere full of love for their own even if they cant understand why the plans they made for you aren't making you happy. I can't recommend this film enough. The film hits various home video platforms tomorrow and is a must see for anyone who just wants a great film.